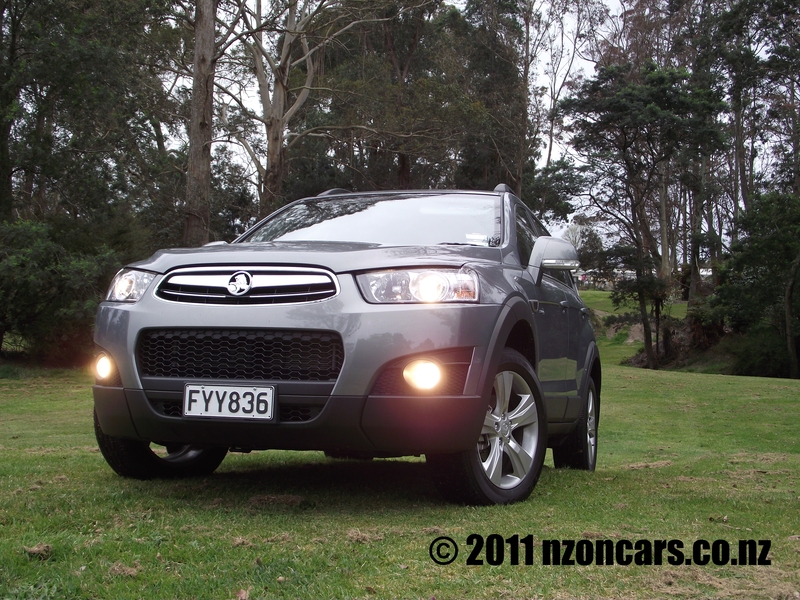 Being in the market for a seven seater myself I was fairly excited to get my hands on the 2011 Series II Holden Captiva 7 CX, although it was in the back of my mind that this could very well be another poorly built re-badged Opel/Vauxhall. Oddly I was totally, completely and utterly wrong, that doesn’t happen often, unless you ask my wife of course. 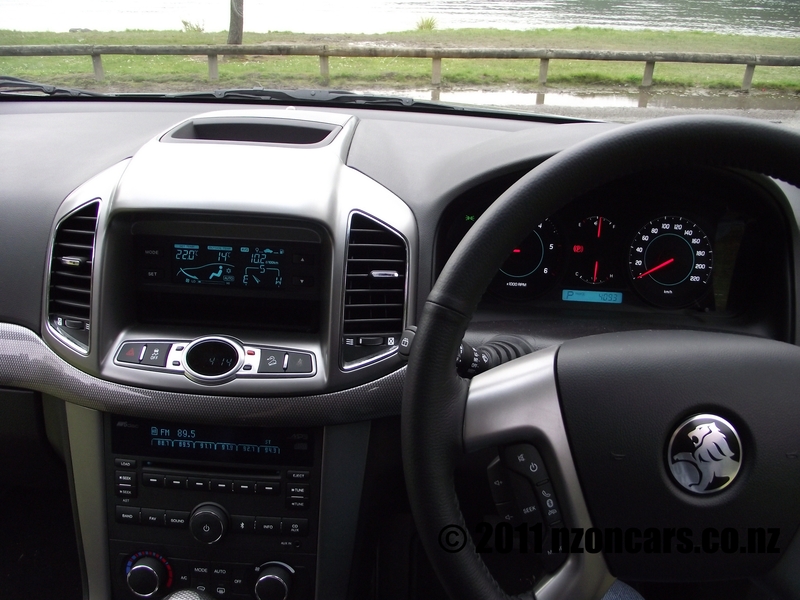 The Holden Captiva was developed by GM’s South Korean division, Daewoo, sold internationally as a Chevrolet Captiva and the same platform is used in Europe for the Opel Antara. 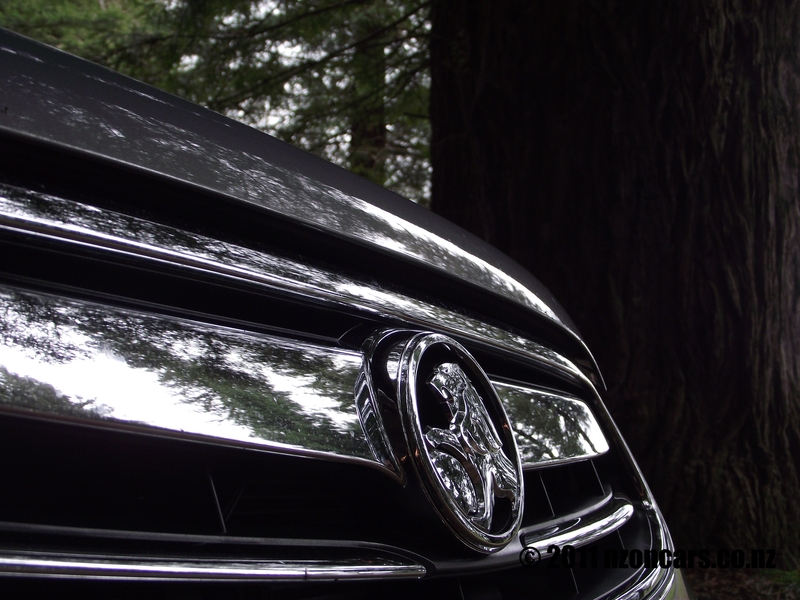 Thankfully though the Australasian specification derivatives are Australian built and individual for our markets, the quality is a huge improvement on other Holden models, previous and current. For the Series II, Holden gave the Captiva three all new hi-tech, high performance engines that show great improvements in power and fuel efficiency. 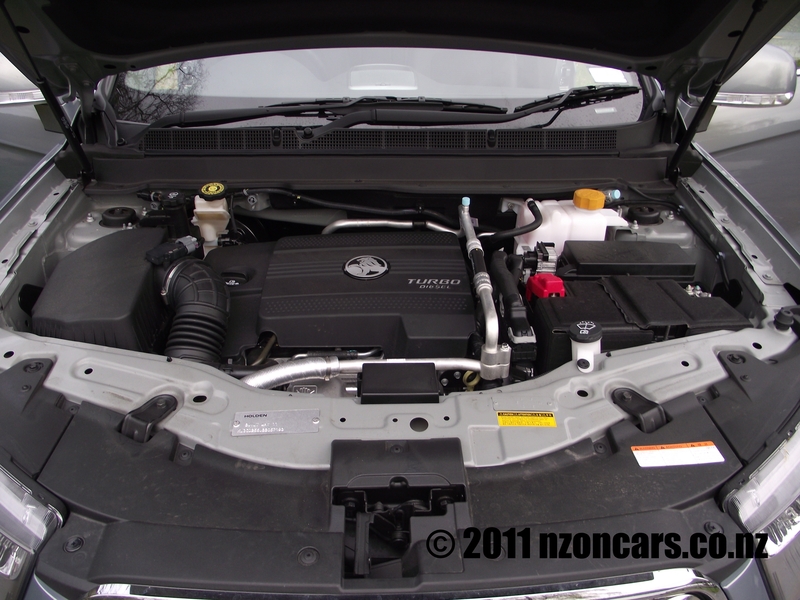 The base SX Captiva comes with the 123kW, 230Nm, 2.4 litre four cylinder petrol engine ($41.890). The top spec LX Captiva ($55,890) and mid range CX ($50,890) both come standard with a 190kW litre SIDI Direct Injection V6 direct from the Commodore. All three variations have the option of the 2.2 litre, 135kW, 400Nm four cylinder Common Rail Turbo Diesel engine (SX $45,890, CX $52,890, LX $57,890). 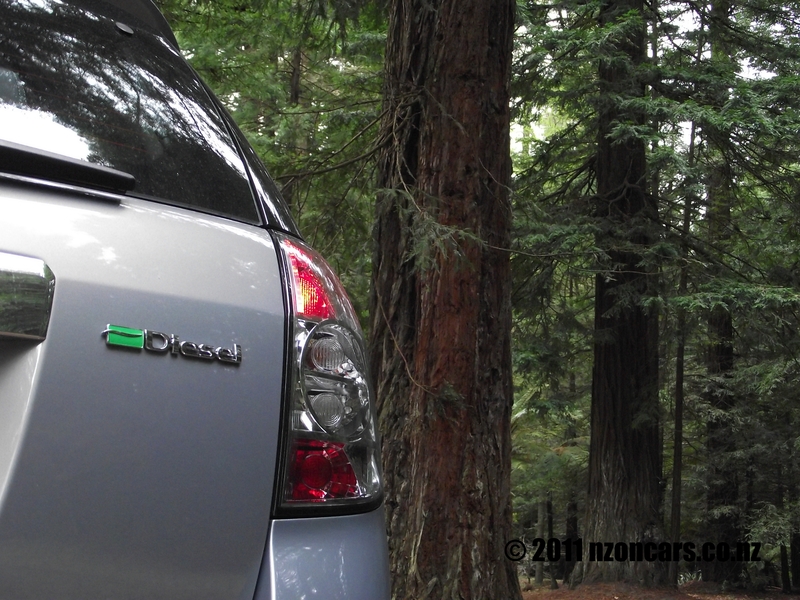 But back to my test vehicle which is the mid range CX and was fitted with the optional Turbo Diesel power plant. One niggle I found with this oil consuming engine that, aside from the fact that from outside of the vehicle it sounds like a Kenworth, is an annoying lag when accelerating from a stand still or from low speed. The first time I planted my foot at one of the useless motorway on-ramp traffic lights in an attempt to beat the boy racer in his blue, lowered, noisy Nissan Sylvia to my left I thought I had somehow stalled the Captiva. It was almost as though the car was thinking “Ok, what gear do I need, oh, first. Ok, now, how much torque do I need, right, now, hill start assist on…. Oh, what, you want to move driver? Ah…” Once that power finally came though it was game on and this over 1800kg beast takes off like a cat with its tail trod on by a size 9. Bear in mind though it’s far from supercar performance but the Turbo helps to push its bulk away and up to the open road speed limit respectably in less than 10 seconds. While we had the opportunity to test a seven seater, what better way than loading up all those extra seats with bodies and head to Rotorua for the day. Live bodies that is. 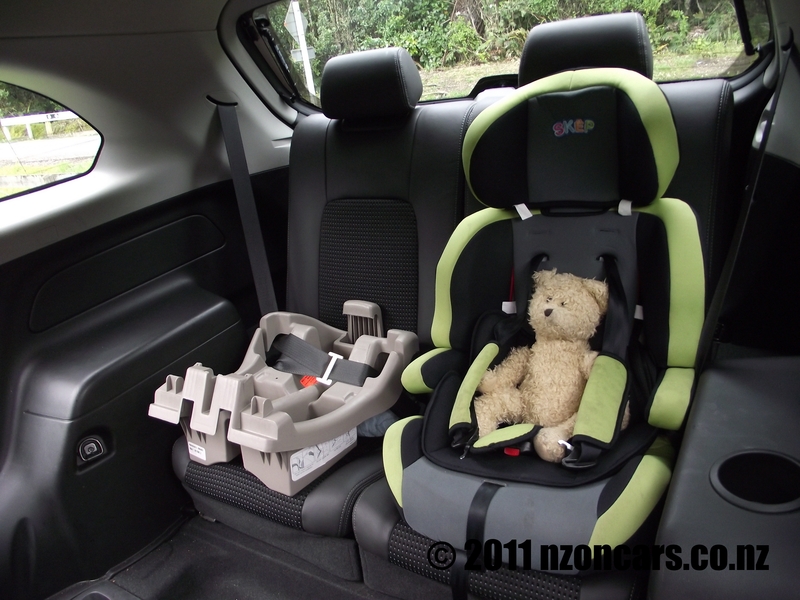 Setting off early on an average spring morning we packed the two littlies into the rear seats and it has to be said with the ability to completely fold up the middle row of seats it was a breeze fitting our 4 year old girls’ car seat and the base for our 2 month old sons capsule. Next was loading the luggage needed for these two occupants and the younger they are the more they need! The youngest needed a fairly large bag loaded with nappies, liquid food, nappies, extra clothes, liquid food, nappies and so on and then there’s the stroller that the capsule snaps onto. This contraption folds down quite flat compared to most push chairs so it, as I thought, would be the easiest option given the amount of luggage space the extra seats consume. Unfortunately even this proved a struggle to squeeze into the remaining space at the back, wound up having to remove the wheels from the stroller to be able to close the tailgate. If the body was just a couple more inches longer it would have made the experience a little more enjoyable. Um, I think I’ve heard that one somewhere before. The bags had to sit at the feet of little miss which by the end of the day did incite a small but brief riot from her. Next it was off to pick up the remaining passengers for our jaunt down to sulphur city, the mother-in-law, her 90+ year old mother and their Japanese homestay student. These three, especially the older two with their reduced flexibility and mobility, found entry, exit and over all comfort very much to their liking. Then we were on the road and what a pleasant trip it was. Around town the lag from the oil sipping soft roaders’ turbo engine can be a bit of a pain but out there on the motorways and state highways it’s a totally different story. The Captiva proved to be a very comfortable and capable open road cruiser easily overtaking all the Sunday drivers and sightseeing tourists. We were only overtaken once during the whole journey down to fart city and this was by one of the most irritating drivers I have seen in a long time. This came in the form of a white BMW M3 coupe complete with rear fog light on, a vanity plate stating that he was a “Born 5INNER”, apparent faulty indicators and not able to keep at a constant speed. This driver, whom we were following for some time, had very little regard for other road users and appeared to be concentrating more on what was going on inside his car rather than driving it. Caught him napping at a passing lane so made the most of the 135 kilowatts in the Series II and zipped past, only to have the M3 make one of the most risky passing moves ever, passing us then attempting to pass the two vans ahead in the same manoeuvre coming up to a bend where even I could see there was oncoming traffic which had the German powerhouse pushing its way in between the vans where even a mini couldn’t fit, all this while still not indicating. Whoops, I appear to have gone a wee bit off track there. Sorry, but drivers like that do tend to get me riled up. 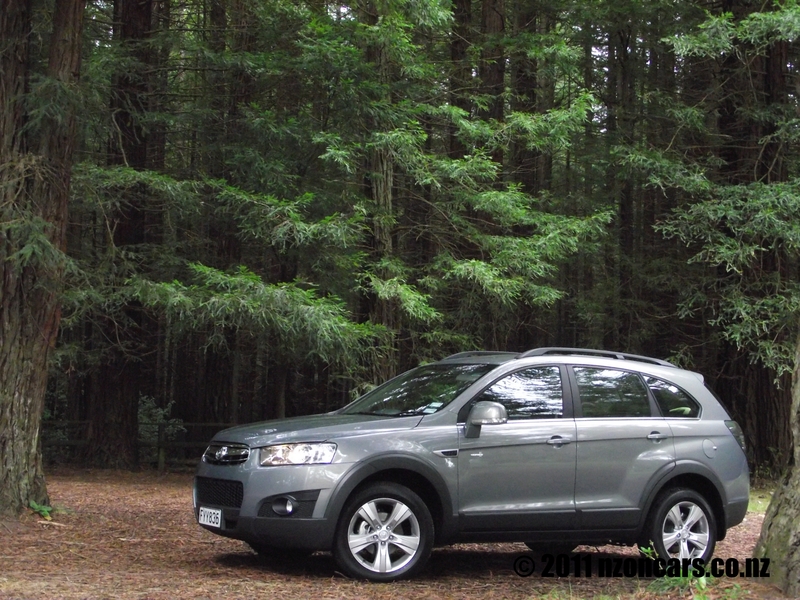 Speaking of off track, it seems a shame that a car such as the Captiva has a great little function suited for off roading, Descent Control System, in a vehicle not made to go off road any further than a grass verge. It’s a pity because with a little more ground clearance, chunky tires and the front and rear end under carriage angled up slightly this could be quite a good off roader with the comfort of a luxury sedan. There are a fair few other electronic gadgets as standard equipment like EBD, ESC, BA, TC, Hill Start Assist, Self Levelling Suspension which lifts the rear end when the car is loaded and Active Rollover Protection, this applies the brakes to each wheel as needed when excessive body roll is detected during cornering to slow the vehicle in order to keep the Captiva from going wheels up. All that, along with more air bags than a mother-in-law convention, help to give the Captiva 7 a four safety rating. Inside the cabin is well appointed, comfortable for all, and has lots of nice little storage compartments to lose things in. there are three little covered compartments in the rear, pockets everywhere and a clever storage bin under the cup holders in the centre console. 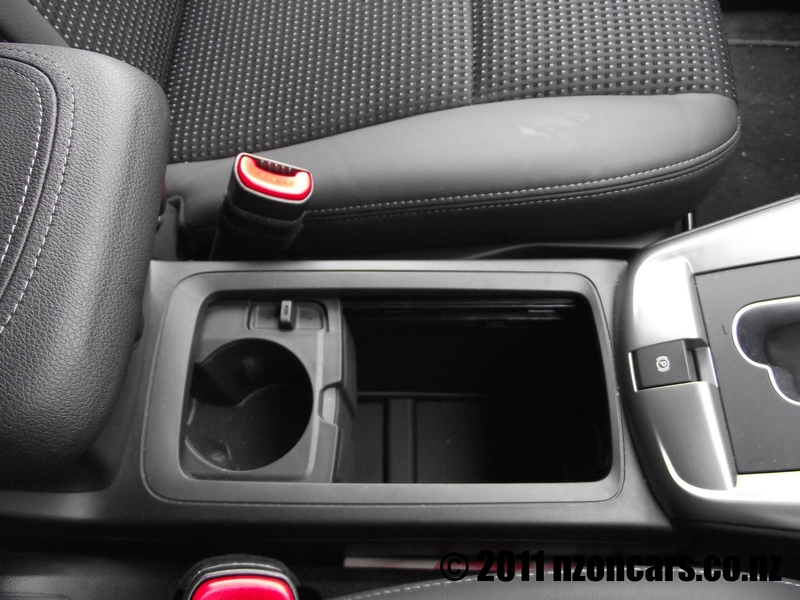 Press the switch like button, slide the cup holders back and you have a space big enough to hide things such as a GPS, iPod, food, drinks, wallet, pet ferret or wet wipes for the littlies. Room has been made for this storage space due to the park brake no longer being the cumbersome, space taking hand brake leaver, it is now a cleaver little switch on the console which can take a bit of getting used to and sometimes might need a second or third attempt to get to work. But I do like this quirky space saving idea. There are another two cup holders in the centre fold out arm rest in the middle row of seats but in the third row I did find it a bit odd that there was only one cup holder, surely it would have made sense to put two back here? Over all this is a very capable and practical family wagon and has me sold on the seven seater concept, no, I won’t go out a buy a people mover now. If my budget allowed, I sure would consider a new Holden Captiva 7, probably would go for the three litre engine though, but then again the 8.3 litres per 100km (claimed) fuel economy on the diesel could be a good selling point. 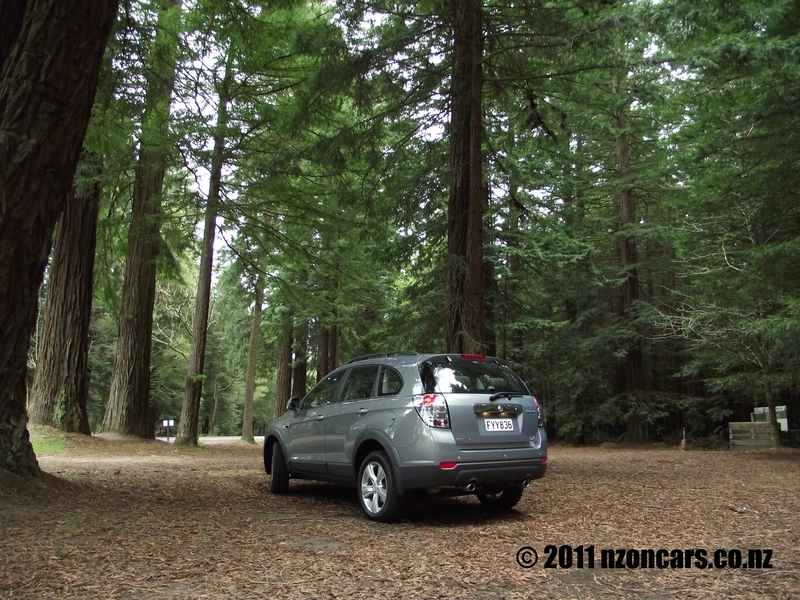 It was certainly surprisingly cheap to run down to Rotovegas and back for a car of this size.